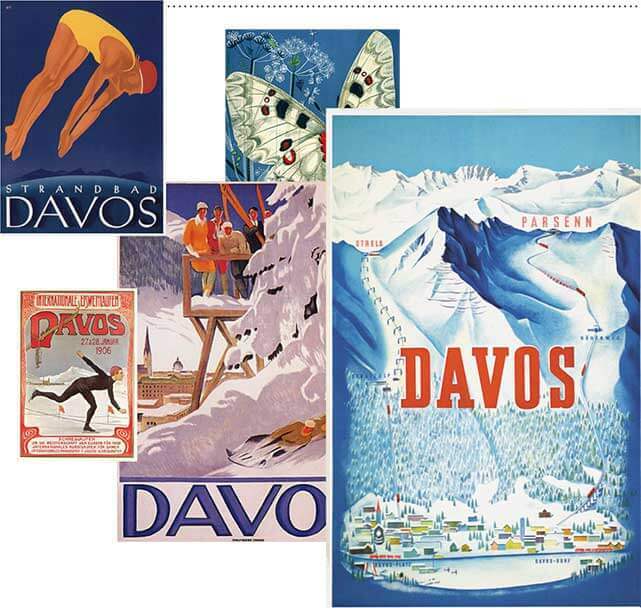 Above: Our art director turned to old travel posters of Davos for inspiration when designing this issue's cover. 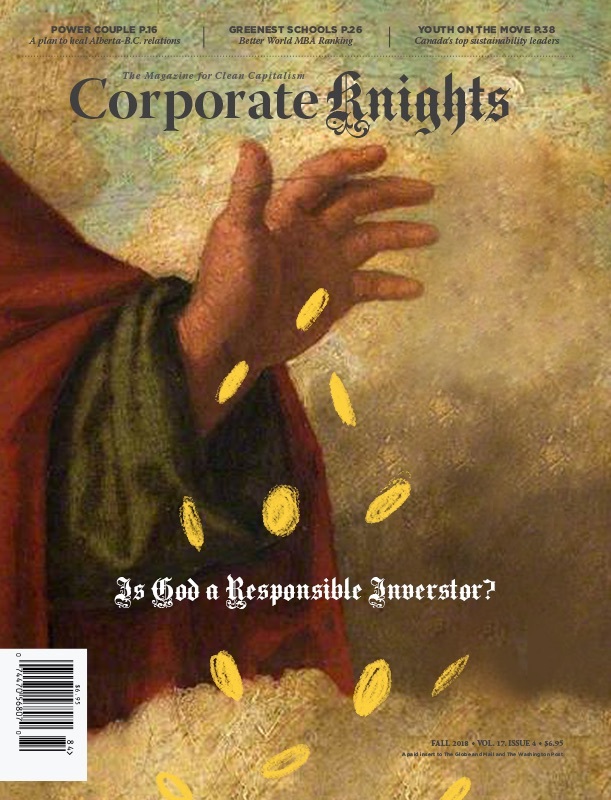 Corporate Knights releases the Global 100 Most Sustainable Corporations in the World list in Davos for a reason. We want to make sure the world’s business elite are on hand to witness which of the largest companies around the globe are becoming more resource-efficient and socially responsible, and making meaningful improvements to their governance structures. It’s both an acknowledgement that some firms have been taking bold and encouraging steps in the right direction, as well as an opportunity to point out that no company is doing enough. Many of these same elites played integral parts in bringing about the conditions that led to the financial crisis of 2008, a catastrophic event that few have taken ownership of. It seems a little soon to be looking to them for global leadership on such a crucial issue as climate change. There’s also the indispensable role that the private sector has played in getting us to the precipice of climate mayhem. One oft-cited 2013 study demonstrated that just 90 companies were responsible for 63 per cent of global carbon dioxide and methane emissions between 1751 and 2010. The banners held aloft by activists at the Paris climate talks and elsewhere point the finger squarely at Big Corporation. Surely these same companies can’t be viewed as part of the solution? It doesn’t help matters when many of these same companies have either directly lobbied, donated to or empowered trade groups to muddy the waters and spread climate change denial over the past few decades. Some leading climate voices like Naomi Klein believe climate change can only be tackled by dismantling our current form of capitalism and ushering in a new age of “managed degrowth,” rendering the modern corporation all but obsolete. Instead of extinction, we at Corporate Knights are advocating for the reinvention of capitalism in a cleaner form. It entails using the power of markets to grow an economy grounded in a golden rule: Business and society must succeed together. Crafting this economic system is going to require heavy lifting from citizens, elected officials and corporations alike, particularly when confronting the threat of rising global temperatures. Each of them will need to hold the others to account and pressure one another to do more. Some impetus will continue to come from mass mobilization, what environmentalist Paul Hawken describes as “the largest movement the world has ever seen.” Other pressure needs to come from economic and political leaders. Each camp has a corresponding role to play. One poignant example of this is the threat of stranded assets and unburnable carbon. The fossil fuel divestment movement has successfully forced the issue onto the table across much of the western world, beginning with university campuses and spreading out from there. At the same time, the idea that combating climate change will entail leaving fossil fuels in the ground has begun to gain credence in the financial community thanks to members of the “club” speaking out in favour of it. Economic elites such as IMF managing director Christine Lagarde and Bank of England governor Mark Carney (see here for an in-depth profile) have sent signals to global markets in a way that the popular divestment movement isn’t quite able to. This is why we’re going to need some Davos Men, and Women, at the solutions table.